Photos by Cheryl Wertman – Kendall players and coaches celebrate after capturing the Class D Far West Regional soccer championship Saturday with a thrilling 1-0 victory over North Collins at Webster Thomas High School. Hailee Mitchell’s team leading 27th goal of the season with just 3:48 remaining earned Kendall the victory sending the Lady Eagles to the state semifinals for the first time since 2003. Kendall will face Central Regional champion Cincinnatus High from Section III in the semis at 12:30 p.m. Saturday at Homer High School near Cortland. Kendall is 16-5 and Cincinnatus 20-0. Cincinnatus edged Downsville (Section IV) 1-0 in the Central Regional. The other state semi will match Fort Ann (Section II) vs. Parishville-Hopinton (Section X). The state championship game will be held at 10:30 a.m. next Sunday at Thompkins Cortland Community College. 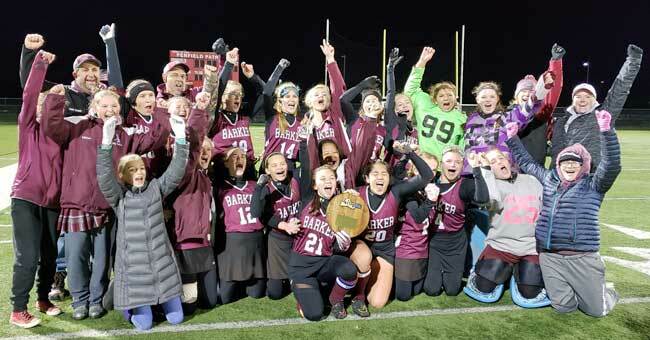 Barker players and coaches celebrate after nipping East Rochester 4-3 in an overtime thriller for the Class C Far West Regional field hockey championship Saturday at Penfield High School. Katrina Clare made her milestone 30th goal of the season, and third of the evening, a huge one as she scored with just 1:30 remaining in the first overtime period to give Barker the win and advance the Lady Raiders to the state semifinals for the third time in the last seven years. Barker, which is now 17-3, will face Carle Place (Section VIII) in the semifinals at 3 p.m. Saturday at Williamsville North. Carle Place bested Pierson (Section XI) 7-0 in the Long Island Regional. 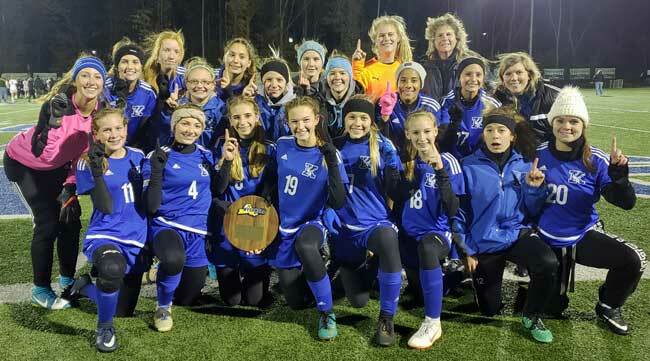 The other state semi will have Whitney Point (Section IV) vs. Hoosick Falls (Section II) also at 3 p.m. The state championship game will be held at 3 p.m. Sunday at Williamsville North.